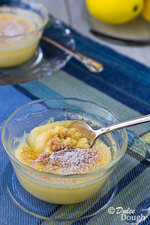 Lemon Cake Pudding is such a simple dessert yet versatile dessert. It can be baked in either 6 small custard cups or in one quart size baking dish. As it bakes, a pudding forms on the bottom while the top bakes into a layer of cake. And as you dig in to enjoy, the two layers blend together for a perfect dessert. It can be served warm or cold. You can dress it up with fresh fruit or whipped cream, or simply serve it with a light dusting of powdered sugar which is the way we like it. 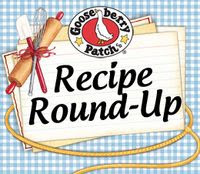 This is another recipe adapted from my grandmother’s Betty Crocker Cookbook, although it isn't one that I remember her making. The cookbook offers “key recipes” and then provides variations of the key recipes. Variations for this particular recipe include lime, orange, and pineapple. Next time I am trying the pineapple variation! As this lemon dessert bakes, a pudding forms on the bottom while the top bakes into a layer of cake. 1. In a bowl, whisk or sift together flour, sugar, and salt.2. Stir in lemon zest, lemon juice, egg yolks, and milk.3. Fold in egg whites.4. Pour into 1 quart casserole or 6 custard cups/ramekins.5. Fill a baking pan (9" x 13") with 1 inch of water and set casserole or custard cups in pan of water.6. Bake for 50 minutes in a 350° oven.7. Serve warm or cold; dust with confectioners' sugar or top with fresh fruit or whipped cream if desired. Love this! I'm definately trying this soon, and great pictures too! I just saw an add for this cookbook today. This sounds wonderful and not only do I have plenty of lemons but all the ingredients as well. I'm making this. Thanks for sharing. Now I need to check out that cookbook. I am sure pineapple would taste as great as the lemon in this cake pudding. My fiance loves pudding cakes, but usually the ones out of the box. I will have to try this for him. Looks great! I had no idea that making lemon cake pudding was so easy! I will have to try this out soon! My mom had a recipe similar to this that she used to make is a large casserole. I should pull it out again sometime! This is one of the best flavor combos. I've been using a lot of it this summer - looks like a wonderful dessert!